ROV: Return on Vision®. The special Return only a CEO can give. There is one kind of return only a CEO can provide: Return on Vision (ROV). Vision made clear transforms companies. It leads the strategy. Its return is engagement, inspiration, culture of innovation, higher revenue and best brand. As brand specialists we work with CEOs on the vision mechanics that create clarity and focus, making the company brand-able as #1. To be brand builders, we start as vision builders. The results are brands with unique, own-able categories, great names, taglines and Micro-Scripts that sell. But it all starts with Return on Vision: The CEO’s vision made crystal clear. We finally put our finger on a phenomenon we’ve been witnessing whenever we work directly with CEOs and their teams over the past several years. Something transformative and dramatic happens that energizes and engages the company. It turns out that the mechanics that were getting us to the center of the brand–the mechanics I wrote about in my books and learned at the original Mad Men Agency in New York–these mechanics were also taking us to the center of the CEO’s vision for the entire enterprise. The mechanics were the same! Whenever we opened up the hood on the vision with the CEO and we applied the kind of crystal clarification that we learned to do because we’re trained MadMen — amazing, uplifting things would happen to the CEO and team and then the whole company. We realized we were doing something way beyond what people think of as “branding” when this was happening. Maybe we should call it visioning. The CEOs vision made clear was the key to everything. The vision became the strategy. And what that did is what made the company brand-able as a #1 brand. A company’s true brand is the CEO’s vision taken forward and made systematic. That vision is how leaders lead and followers are inspired. It’s strength is directly proportional to how clear it is. When its polished like a diamond the way we can do it, the leader just has to step back and get out of the way because the people will move heaven and earth to go where it points them–to have a chance to touch greatness. Most people don’t go through life with an inspiring mission. Help them see one and you can’t hold them back. The greatest adman of them all–the actual real Don Draper said: “In ancient times when Cicero spoke the people said ‘how well he spoke.’ But when Demosthenes spoke the people said: Let us march! This is what we’re talking about. The Return on Vision is engagement, innovation culture, inspiration, sales and success. ROV comes before any kind of ROE. There is nothing more powerful than Return on Vision. The Differentiators vs. Image Sellers. Which Will You Be? “Branding is about putting you in touch with an emotional feeling. So good branding should not focus on your product which will bore today’s audience, its job is to make you laugh or make you cry.” Then they show a 30 second commercial where you have no idea what the product is, let alone why to buy it. Their mission is to amuse. But this is precisely the opposite of what you would hear from the great brand thinkers and writers who invented the most powerful brands of all times, the kind of brands that can become household names and last for decades. First and foremost, a brand is an idea: the most specific, important difference you stand for in the mind of another person. It’s a factual difference that sets you apart from others in a category. Celebrities, religions and countries can be brands, too, if they stand for something unique. Indeed, they can make you laugh or cry. But if you are in business, you are only interested in a very special kind of brand: A brand that makes you buy. This is what we call a selling brand. And it’s different than any other kind. A selling brand is not about producing emotions, millions of page views or awareness for its own sake. After all, you can get ten million page views of a bear in a tutu dancing on the roof of your house– but it may not cause a single person to buy the house. Awareness is just the first step. With a selling brand, once you have someone’s attention, you must pull them into the ranks of the persuaded–by making them a unique proposition–a promise to solve a problem better than competitors can by giving them a specific benefit, and a specific reason to believe you. This is the only way you can move them to buy your product amid the thousands of choices they have. The brand Emotion-ists, on the other hand, believe their job is to create feelings. Thus the spotlight should be on creative department’s clever execution, not on the product. Differentiators do the opposite. They make the product the star–the most interesting part of the commercial or message they’re purveying. To do it, they lead with the “facts of a difference”–compelling product facts that they knit together into an irresistible story. Then they let the customer connect their own emotions to those facts, based on their own experience in their own lives. They know that such feelings will be more vivid and powerful than any marketer could ever make them. • When Apple introduced their revolutionary ipod, they didn’t need to remind you of the joy of music. Instead, they gave you a startling, revolutionary fact: It’s like having 10,000 songs in your pocket. • When Boeing offered the 747, they said it’s a “Jumbo Jet” that can carry 450 passengers from New York to Sydney non-stop. • When Netflix appeared on the scene, they told you the facts of their difference–it was ‘videos in the mail vs. videos at the store.’ Suddenly, no more late fees, no more being told all the hits were all out, and you could keep it as long as you want. • When Kindle came out with its new Paperwhite reading tablet, it showed you a difference: now you could read comfortably in any light–even on the beach. • When Chobani created a veritable yogurt revolution for its Greek yogurt, it got straight to the point and told us: It’s super food compared to regular yogurt–it’s twice the protein, half the fat! Facts first, feelings follow. In every case, the sellers supplied the dramatic facts; the buyers supplied all the emotion necessary and shortly thereafter, their dollars. This is the philosophy of reality sell vs. emotional sell and it is the core of what we believe. Never has reality sell been more important to practice than it is today. Unless you are visiting a website like match.com–we believe that no customer shows up looking for an emotional relationship with you. They are looking for a solution to a serious problem which is often the difference between success or failure. Once you’ve showed that you can deliver the results at a fair price in a consistent way– then they will welcome a relationship with open arms. Volvo–safest car. Hertz–#1 Rental Car Company. BMW–Best driving car. Duracell–most dependable battery. Southwest–#1 low cost airline (used to be, anyway). 2. Story: A Selling Brand is a story–one that only you can tell. “People had a problem. A company came to solve it. Here’s what they did. Now life is better.” The story always supports the Dominant Selling Idea at the center. 3. Facts of the Difference: All stories are built on a set of facts–specific facts. So selling brands use dramatic, measurable facts to build their stories. The facts trigger the visualizations, emotions and the feelings in the listener. The Rule is: Facts first, feelings follow. 4. Look & feel, tone & personality are important and need to be consistent in a Selling Brand. However, they must only serve to advance the story and the Dominant Selling Idea, never distract from, confuse or impede it. All execution must emanate from and point back to the strategic idea at the center of the brand. 5. Use Competitive Claims: Selling Brands accept the business reality that for one company to win the sale, another company must come in second. They are in business to give their customers an advantage, and their duty is to communicate it confidently and clearly. If they believe they are better or best, then they must say they are better or best without mincing words. They can not be afraid to put competitive, challenging claims front and center. At the end of the day, beyond our words and claims, we must know that brands succeed on performance more than anything else. Branding is just an invitation for someone to experience our product. After that, only action counts. The brand happens in the customer’s mind when she feels the car hug the road, gets extra leg room in coach, is answered in one ring or has her headache go away. We also know that there are exceptions to every rule including the ones above. There are great campaigns that have violated every part of our formula and worked anyway. But if the objective of our brand is to seek sales, not applause, to put the wind at our backs, to show the customer a better way, not just a better ad or more entertaining video– then the percentages will always be with us if we follow the Brand Differentiators vs. the Emotion-ists and practice the timeless rules of Reality Sell. Our challenge is, as it always was, to make our branding and execution–from our websites to our sales conversations–stand up to the test of the Selling Brand. The Real Don Draper. His Legendary Book–Back in Print! His book is called Reality in Advertising. It was published in 1961 at the height of the Mad Men era by the greatest of them all, Rosser Reeves, Chairman of Ted Bates, NY–the agency that gave us brands with taglines like “Melts in Your Mouth, Not in Your Hand.” Many knowledgeable sources–Wikipedia included, credit Rosser Reeves, a copy writing genius who rose to lead one of the most influential agencies of all time, as the real Don Draper. 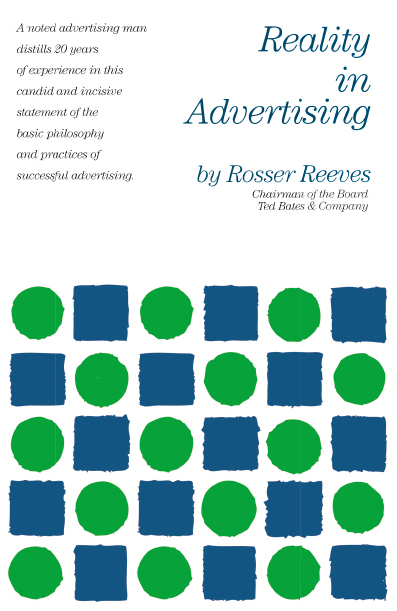 It’s the book where Rosser unveiled the art and practice of the U.S.P., the Unique Selling Proposition, the first time anyone had analyzed sales-effective advertising down to a few, practical, repeatable principles. To some, the U.S.P. was as important a breakthrough for advertising as E=MC(2) was for physics. David Ogilvy, President of Ogilvy Mather said he would order a copy for every one of his employees and every client. In fact, Ogilvy himself was Rosser’s brother in law and would tell close friends that he learned everything he knew from Rosser. The book hit the general best seller lists and was reprinted 19 times. It was the foundation for great advertising books that came after like Positioning by Al Ries and Jack Trout. It’s the greatest book on its subject of all time because it explains the nature of communicating the big idea–and it exposes the image peddlers and ’emotion-ists’ who have taken over modern marketing for what they really are– consultants who promote a philosophy of attention-getting creative for its own sake–without any real regard for the product itself or the story that it can tell. Rosser Reeves believed that an ad person’s job was to make the product the most interesting thing in a 30 second commercial. That’s much, much harder than creating 30 seconds of entertainment that’s designed to win applause and awards for the creatives. Making the product difference fascinating is what moves markets, changes buying habits, generates share out of thin air, and motivates millions of people to buy. It’s what marketers used to be paid for. The greatest advertising and marketing book of all time has been out of print for almost 25 years. But now it’s back. We at BrandTeamSix are proud to say that we have been instrumental in making that happen in conjunction with Rosser’s daughter, Lovejoy Reeves Duryea. She shared amazing stories about her father during the years that he wrote the book and was the master of Madison Avenue. Our special thanks go to her. Now a new generation of students can get access to this amazing little book for the price of a regular paperback or a kindle download. None of the proceeds go to us. We did it for the sake of history and to show a new generation the meaning of truth in marketing. Buy it on Amazon or Barnes & Noble in Hardcover, Paperback or kindle. Captain Coward, Chicken of the Sea! If you love Micro-Scripts, could you love anything more?! You can watch them (the Micro-Scripts) being created by Inside Edition and E! with “Captain Coward, Chicken of the Sea” for that Italian Cruise Ship Captain who jumped in the lifeboat first and tried to row away. This is Captain Comedy. Anyway, its a Micro-Script birth we loved. Honorable mention on the same night goes to a commercial for Campbell’s soup, which said: Canned Cream of Chicken makes Ho Hum into Oh Yum! Fabulous. It was like a Mozart Symphony of doggerel.